Linkwood has an exceptionally long and moderately complicated history that I will largely leave to Malt Madness if you're curious. The important bits of information are that the distillery is owned by Diageo, which means that its output is almost exclusively destined for blends, with the exception of the official Flora & Fauna bottling and the semi-offical Gordon & Macphail releases. But some of the casks find their way into the hands of independent bottlers. This whisky was distilled on January 30, 1995, filled into a hogshead, then bottled on August 8, 2011 at 43% without coloring. Nose: strong floral (roses, lavender) and fruit (apple, orange, grape, banana) notes backed up by solid malt, a little grassy, a touch of fresh Ivory soap, mild oak, bubblegum, and vanilla. After adding a few drops of water it becomes softer plus more grain-focused and floral. Taste: sweet, thick malt through out, big bittersweet floral and fruit esters (banana, berries, apple/pear) come in quickly, fade out through drier floral and grassy notes with a touch of savory oak and citrus peel/pith near the back. After dilution it becomes grainier and less sweet, but creamier and more floral/grassy. This is instantly recognizable to anyone who has tried Johnnie Walker Green Label, which has Linkwood as one of its main components. This is a big, characterful malt that will shine in blends, augmenting other less flavorful malt and grain whiskies. While Signatory's Vintage line doesn't get nearly as much praise or attention as their Unchillfiltered or Cask Strength lines, they do offer solid malts at often very respectable prices. While it's possible that this whisky would have been better at a higher strength, it was exceptionally drinkable and had more than enough heft diluted to 43%. There seem to be a number of these casks floating around and I intend to get my hands on at least one or two more. If this one sounds good to you it's still available from the Ultimate Wine Shop. While Highland Park 12 Year is in almost every malt maniac's cabinet and the 18 Year gets regular plaudits, the 15 Year has been a little forlorn within the lineup. Given pressure on their stocks, it looks like the distillery (or more likely the corporate folks at Edrington) has pulled the expression, probably to reserve more casks for the 18 Year and replaced it with Dark Origins at the same price point. This is bottled at 43% probably with chill filtration and possibly without coloring (I've heard conflicting accounts of whether they use it or not now). Nose: maple syrup, integrated sherry, American oak (caramel, vanilla), baking spices, twiggy malt, heather, herbal, light peat, peach, strawberry, raspberry. After adding a few drops of water, the sherry and oak integrate, the baking spices resolve into woody cinnamon, and the peat fades away. Taste: opens with sweet sherry, raisins, American oak with herbal/floral/heather-y peat overtones, mesquite honey, and darker sherry through the middle, fresh dry malt near the back as the sherry slips away to reveal a bit more peat and oak. After dilution the sweetness becomes stronger and brighter, with the oak and peat fading into the background. The defining feature of this Highland Park is the American oak. While, like its 12 and 18 year old counterparts, it is matured entirely in ex-sherry casks, the 15 Year is constructed with more American oak than European oak casks. This gives it character that you would expect from an ex-bourbon cask malt, but with plenty of sherry on top. The extra age has also softened the peat in comparison to its younger sibling, which gives it a much more approachable character. Instead of the whipsaw from sweetness to peat, the transition is more gentle. That's not to say that it's flat or insipid, though I do think that it, like the 12 Year, would have benefited from a bump to 46% and craft presentation. This goes double in Europe where it was bottled at 40% rather than 43% as it is in the States. 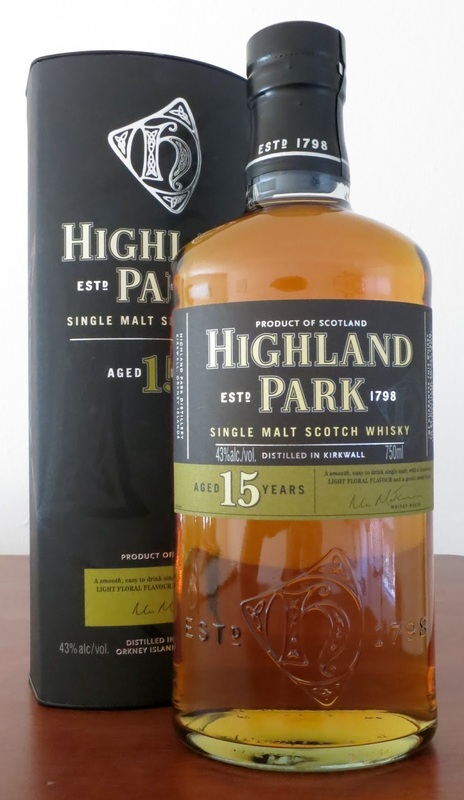 Basically, if you enjoy sherry-driven malts and can find Highland Park 15 Year for under $80, which, after a cursory search appears to be possible in many places, it's a no-brainer. While the 18 Year gets most of the plaudits, in an era of rising prices the 15 Year can be a solid value. I've only tried Glen Grant twice before - the standard 10 Year and a Berry Brothers & Rudd 1974 single cask. Neither has given me much of a basis for judging the distillery as a whole, so I came at this sample without many expectations. The WhiskyBase shop tossed a sample into one of my orders, so I gave it a try. This whisky was distilled on July 5th 1990, filled into a hogshead, then bottled on September 23rd 2015 at 56.6% without coloring or chill filtration. Nose: soft and subdued - lots of oak, something between floral and musky fruit notes (melon), glue paste, sweet malt, vanilla, roasted corn, grassy, citrus peel. After adding a few drops of water the oak becomes more expansive and wipes out some of the nuance. Taste: big malt and cask sweetness up front, slightly tempered by soft oak tannins, becomes generically fruity around the middle, then fades into bittersweet hay and malt near the back. After dilution the generic fruitiness spreads out to encompass the entire palate, syncing up with the oak to give it an almost sherried quality. On the face of it, this isn't a bad whisky. It reads somewhere between the grassier end of Speyside and the fruiter end of the Lowlands. There are no major flaws, it's generally enjoyable, and it's not terribly expensive for a 25 year old single malt in this day and age. Importantly, it's still available. At the same time, there are other single cask bottlings from the same distillery at roughly the same age that are 2/3-1/2 the price, which makes me pretty disinclined to recommend this one. It's not bad, but I feel like it should be better for the money. Cragganmore is one of Diageo's core Speyside malt distilleries. It forms the basis for a number of their critical blends, especially Green Label, but is also bottled as a single malt for their Classic Malts series. The distillery is distinguished by a few characteristics: their malt is lightly peated (I've seen 3 PPM, but that is barely over the natural phenol content, so I would guess more like 5-8 PPM), their spirit stills are 'T-shaped', with a truncated top instead of the usual gentle swan neck curve, and the spirit is condensed in worm tubs rather than the now-standard shell condensers. The 12 Year is bottled at 40% with coloring and chill filtration. Nose: very malty, savory caramel, moderate dry oak, fizzy bourbon cask fruit/berry esters, a hint of citrus peel, grassy/floral, vanilla, a touch of peat. After adding a few drops of water the malt becomes bigger and musky, and some honey graham cracker notes come out. Taste: malty sweetness up front, bourbon cask fruit esters, vanilla, bubblegum, floral and grassy notes ride above the middle, fade out through savory notes, bittersweet oak/tea, and dry malt/grass with just a touch of peat. After dilution the bittersweet oak becomes much stronger and spreads across the palate, giving it a drier character. I tried this once before at a bar and recorded very similar notes. This is one of those whiskies that feels like it could be so much more, but as so frequently happens Diageo has neutered it in an effort to broaden its appeal. While it's arguably got a bit more going on than the standard Glens, the equally priced and equally available Clynelish 14 Year trumps it in every category. I was glad to only have a 200 mL bottle of this whisky, which is exactly what I expected despite the higher unit cost. What this does do is convince me that I want to try some indie Cragganmore. Glen Scotia is the frequently-neglected member of the current Campbeltown trio. Until recently very few official bottlings of Glen Scotia were available. The line was relaunched first in 2013 then again within the last year after the first proved too ambitious. Before then the best way to try Glen Scotia was through independent bottlings. The Gordon & Macphail I tried was a bit of an odd duck, but it was young, low proof, and from bourbon casks. This release from The Whisky Agency was fully matured in a sherry cask (and what a sherry cask, judging from the color) and bottled at a healthier 46%. Taste: briefly sweet up front, which is quickly overwhelmed by dry sherry and black pepper/sulphur spiciness, fading into rising tannins and chocolate covered coffee beans near the back, with an undercurrent of creamy malt riding throughout. After dilution it becomes much sweeter, with more fruity sherry and integrated sulphur, the malt is more apparent, and some nuttiness comes out, the spiciness is turned down, but it feels flatter. Well, this certainly was an active cask. And one that was sterilized with a hefty sulphur candle before it was filled. So if you like those big, sulfurous whiskies, this might tickle your fancy. While I found things to like, I was disappointing that the distillery character had been mostly overwhelmed, other than a certain dirtiness that might have been more about the cask than the spirit. But if this sounds like something that would tickle your fancy it's still available from some European retailers for a fairly reasonable price given its age.